The old food crisis, the chronic food crisis and the coming food crisis? In 2008 the price for many basic foods increased dramatically. This led to rioting in many countries such as Haiti, Bangladesh, Egypt and many African countries. This chaos and the strains that the food price increases have caused on the world's poor were dubbed a "food crisis", which it surely was. However, older reports from the United Nations claim that the death rate for malnourished people is ridiculously high - 3 times higher than the death rate due to World War II. Even if this is an exaggeration, then this is still a ridiculously large problem, large enough that it deserved the title "food crisis" long before we were using that term in 2008. As such I refer to the ongoing problem as the chronic food crisis. News recently broke that prices for basic foods have risen higher than they were two years ago when the previous food crisis involving food rioting occurred (according to the United Nation's Food and Agriculture Organization). Here's a plot of price indeces for various basic foods that I obtained from this Nature.com article. 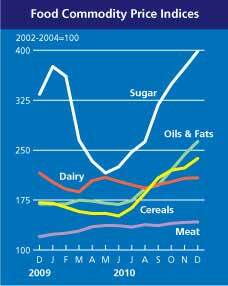 It demonstrates a lot of increase in the prices of sugar, oils & fats, and cereals. If these prices remain high then we might be about to experience a second food crisis on top of the existing chronic food crisis. The first chapter of my book is devoted to the chronic food crisis - you can check it out here. Spotlight-on-Science has also many existing articles on food related issues, you can check them out by clicking here.